With Halloween fast approaching, many children are looking forward to dressing up in their favorite costumes and collecting candy when they go trick-or-treating. While this is a fun custom for children, eating all of the candy is not a good idea. The following guide provides you with tips to use to ensure your child's teeth are exposed to as little sugar as possible this Halloween. When you tell your children that they cannot have all of the candy that they collected, they will want to know why. Understanding how candy affects your child's teeth will help you to explain why you won’t allow them to consume all of the candy they collect. White, milk and dark chocolates are delicious but can all be very damaging to the teeth. The sugar contained in the chocolate feeds bacteria in the mouth. As a result, the bacteria produces acids that erode the teeth’s enamel. Chocolate can also cause teeth to become stained. When this happens, they can have a yellow or even brown tint to them that is not visually appealing. Gummy candies are not good for children because they often break apart as children chew and become stuck between the teeth. When sugary candy gets stuck between the teeth, it allows the sugar to have prolonged exposure to the bacteria in the mouth. This exposure leads to acids building up between the teeth and causing cavities to form over time. Nougat and toffee are not good options for your child either. That’s because nougat and toffee are both very sticky. If your child has caps on their teeth or fillings in their teeth, the nougat and toffee can stick to them and pull them loose. This could be quite painful for your child because the root of their tooth could become exposed. Many parents are misinformed about gum and assume that it is safe for children to chew as long as it is sugar-free, but that is not necessarily the case. Gum not only has ingredients in it that can cause decalcification of your child's teeth, but it can also cause your child to have abdominal issues. The ingredients in some gums cause children to have an irritable bowel. This condition can lead to diarrhea, which can be quite painful. Chewing gum can also lead to abdominal swelling from children ingesting a lot of air when they chew. 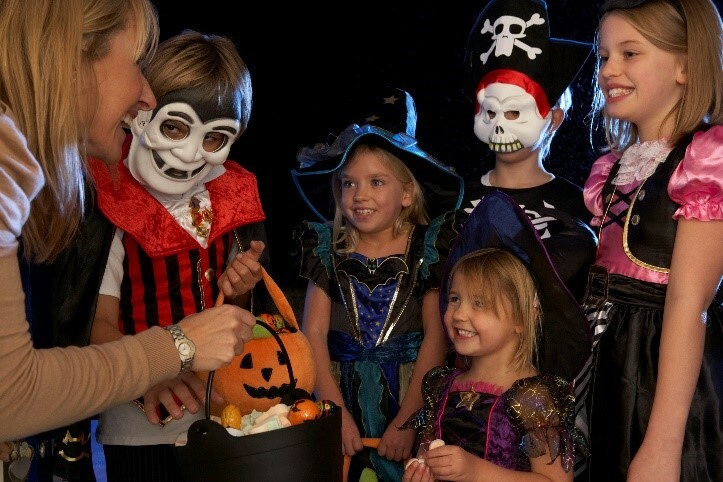 Before you take your child out to go trick-or-tricking, talk to them about the candy situation. Let them know how the candy can affect their teeth and why you do not want them to eat a lot of it. It is not reasonable to tell children they cannot have any of the candy though. Allow them to pick out a few of their favorite pieces. Your child needs to brush their teeth thorough that night, but wait at least 30 minutes between the last piece of candy and tooth-brushing. If your child brushes before that, while the acid from the candy is still at work on their teeth, they may damage their tooth enamel by rubbing it while it’s softened up. Have your child wait a while, then do a great job brushing their teeth. Talk to the dental staff at Milner Dentistry if you have any questions about Halloween candy this year. They can help you properly prepare to talk to your child about candy consumption and take care of any issues that may arise from your child eating candy this holiday season.